This page documents the tornadoes and tornado outbreaks of 2012. Extremely destructive tornadoes form most frequently in the U.S., Bangladesh, Brazil and Eastern India, but they can occur almost anywhere under the right conditions. Tornadoes also appear regularly in neighboring southern Canada during the Northern Hemisphere's summer season, and somewhat regularly in Europe, Asia, Argentina, and Australia. There were 939 tornadoes confirmed in the U.S. in 2012. 86 fatalities have been confirmed worldwide in 2012: one each in Poland, Japan and Italy, three in New Zealand, five in Indonesia, six in Turkey and 69 in the United States. Map of all killer tornadoes within the United States in 2012. Only affected counties with fatalities are highlighted along the tracks. The year began with an unusual number of tornadoes during January 2012. The first major tornado outbreak occurred on January 22–23, when a spring-like system moved across the southern Mississippi valley, producing at least two dozen confirmed tornadoes across Arkansas, Kentucky, Mississippi, Tennessee, and Alabama. As a whole, January was the third most active on record, behind 1999 and 2008. Despite this, a significant contrast in activity occurred for the month of February. Despite a slow beginning, the month of February ended with a significant tornado outbreak on the 28th and 29th with a strong EF4 doing significant damage and killing eight in Harrisburg, Illinois. Another ramp-up in activity occurred in early March, with one of the largest outbreaks ever recorded in the United States for that time of the year. This outbreak produced 160 reported tornadoes, and affected areas across Indiana and Kentucky in particular. Using the adjusted preliminary tornado count (85% of the total preliminary reports in order to remove overcount), 2012 attained record tornado activity on March 23 with 319 reports, eclipsing the previous record of 317. A relative lull in tornado activity occurred in mid-March, but activity soon rose again by the end of the month when an EF2 killed one person on March 23 near Louisville, Kentucky. The beginning of April also started off active, with a tornado outbreak occurring in North Texas, including the Dallas-Fort Worth Metroplex. An EF2 caused significant damage in the city of Arlington, where a state of disaster was declared. An EF3 also caused significant damage in Forney, Texas; despite this, no fatalities were reported throughout the outbreak. From April 13–16, an outbreak producing over 95 confirmed tornadoes swept across the Midwest, Kansas and Oklahoma in particular. A tornado emergency was issued for the city of Wichita late on April 14 as an EF3 moved across the southeastern portion of the city. A couple hours later, an EF3 in Oklahoma killed six people when it hit the city of Woodward just after midnight. One EF4 tornado was confirmed in Kansas on April 14, where it stripped trees of bark and destroyed a farmstead. On April 30, several tornadoes swept across Oklahoma and Kansas. By contrast, May was much quieter than usual for what is normally the most active month. Several minor outbreaks were spread around the month but no major outbreaks and no fatalities took place. June was also quiet, although there were a few small outbreaks. These included an EF2 on June 4 that caused three fatalities in Diehlstadt, Missouri and a small outbreak in Florida associated with Tropical Storm Debby that killed one person. The summer months were among the quietest on record as a persistent ridge prevented any significant storms from developing in the United States, as cooler air was unable to penetrate southward and was held into Canada (similar to February 2010 when warm air was suppressed into the Caribbean). July was very quiet with only 35 confirmed tornadoes. August and September were also generally very quiet as well, broken only by an active period after Hurricane Isaac made landfall, producing a sizable multi-day tornado outbreak. October continued to be quiet with only 30 confirmed tornadoes throughout the month. As of November 25, 2012 ranks as the quietest year for tornadoes in the United States, with an estimated 885 tornadoes, below the previous record minimum for that point in the year of 920 tornadoes. Unlike 2011, 2012 went without an EF5 tornado. There were 97 tornadoes reported in the U.S. in January, of which 79 were confirmed. Radar image of the severe thunderstorm that spawned an EF1 tornado near Mission Bend, Texas on January 9. On the morning of January 9, a mid-level area of low pressure moved east-northeast across the Big Bend of Texas and triggered the development of a surface low in southeastern Texas before noon local time. Along the eastern side of this system, warm, moist air from the Gulf of Mexico was drawn northward and created an environment favoring supercell thunderstorms, though widespread clouds limited the extent of activity. A line of strong thunderstorms developed in southeastern Texas around 9:00 a.m. CST moved slowly eastward. Only isolated reports of damaging winds and a few tornadoes accompanied this line and no tornado or severe thunderstorm watches were issued. Five tornadoes touched down in association with this line of storms, one of which was an EF1 that caused significant damage to a home near Mission Bend, Texas. Developing into an upper-level system over the Ark-La-Tex region on January 10, the risk for more widespread severe weather was evident; however, only isolated reports were received that day. Continuing eastward, additional severe weather was expected along coastal North Carolina on January 11 before the system moved into the Atlantic Ocean. However, a severe storm developed in South Carolina and moved into western North Carolina, outside the area anticipated to support tornadoes, and soon spawned a tornado around 5:22 p.m. EST. Rated as a low-end EF2, the tornado tracked for 2.5 mi (4.0 km) and damaged or destroyed dozens of structures near Ellenboro. Ten people were injured by the storm. Continuing northeast, the thunderstorm spawned another, more intense EF2 tornado around 6:04 p.m. that caused extensive damage in the South Fork community. There, several mobile homes were completely destroyed and a few homes sustained significant damage. Eight people in the community were injured by the tornado. Another EF0 tornado touched down less than 20 minutes later before the event ended. As a line of intense thunderstorms moved southward throughout much of the Ohio River Valley and Southeast, many tornadoes were reported. The first tornado of the day occurred near Madison, Indiana, and was rated an EF0 on the Enhanced Fujita scale; only minor damage was reported. The second tornado occurred in Floyd County, Indiana, which destroyed portions of homes and trees; it was later rated an EF1. The third tornado touched down near Clarksville, Indiana, and was rated an EF0 due to the minor damage it caused. One of the first confirmed tornadoes on January 17 was an EF1 near St. Matthews, Kentucky, which injured a truck driver on I-265. The most significant tornado was an EF2 southwest of Scottsville, Kentucky that tore the roof from one home and destroyed numerous weaker structures. Another EF2 tornado destroyed a mobile home and badly damaged several permanent homes near Sandy Hook, Mississippi. A total of 14 tornado reports were called in this day. EF3 damage to a house in Center Point, Alabama. On January 22, the Storm Prediction Center issued a moderate risk for severe weather across parts of the Southern United States and Ohio Valley. Late that afternoon, a Particularly Dangerous Situation tornado watch was issued for much of Arkansas and parts of Tennessee and Mississippi. At sunset, multiple discrete supercell thunderstorms developed over Arkansas and began producing significant tornadoes. An EF2 tornado impacted the northwestern fringes of Fordyce, Arkansas, damaging or destroying multiple homes, collapsing metal truss towers, and heavily damaging a local country club. Another EF2 near Sweden, Arkansas severely damaged a metal building, a radio tower, large grain bins, vehicles, and farm machinery. Two separate tornadoes, rated EF2 and EF1, caused considerable damage to metal truss towers, outbuildings, trees, and power poles near De Witt. Further to the east, multiple mobile homes were destroyed by an EF2 tornado near Alligator, Mississippi. While much of this outbreak was centered across the deep south, several tornadoes touched down further to the north as well. This included an EF2 that touched down near Enfield, Illinois and destroyed many barns, outbuildings, and garages along its path, as well as a communications tower. An EF1 caused moderate damage in the town of Hazel, Kentucky as well. Further south, the storms pushed eastward and grew upscale into and organized squall line around midnight. Overnight and into the very early morning hours, another round of discrete supercell activity developed ahead of the squall line as the storms pushed into Alabama. This resulted in a wave of significant tornadoes that raked across the state just before sunrise. An EF2 heavily damaged or destroyed many homes and mobile homes in the rural community of Oak Grove, killing one person. The most significant tornado of the event was a destructive EF3 that severely impacted parts of the Birmingham metro. This tornado touched down near Tarrant before tearing through Center Point, Chalkville, and Clay, killing one person and destroying hundreds of homes and businesses. Another damaging, long-tracked EF2 tornado first snapped and uprooted thousands of trees in the Talladega National Forest before striking Maplesville, heavily damaging or destroying multiple homes and businesses in town before eventually dissipating near Clanton. Overall, this outbreak produced 25 tornadoes and two deaths. Across Alabama alone, insurers estimated damage from the tornadoes to have been at least $30 million. On January 25, several tornadoes were reported in Texas and Louisiana with a strong storm system that dumped heavy rain across Texas. One of these tornadoes, rated EF1, struck Austin, Texas and caused significant damage to homes and businesses. Losses throughout the city amounted to $1.5 million. A day later on January 26, four more tornadoes were confirmed and on January 27, one tornado was confirmed. Throughout the entire outbreak, 29 tornadoes were confirmed, however, all were weak. There were 63 tornadoes reported in the U.S. in February, of which 55 were confirmed. On February 24, a strong tornado struck South Sulawesi province in Indonesia, killing five people and damaging 98 structures. EF4 damage to a shopping center in Harrisburg, Illinois. A significant and deadly tornado outbreak began in the Great Plains on February 28, as supercell thunderstorms developed and multiple tornadoes touched down across the region. An EF2 tornado struck the small town of Harveyville, Kansas during the late evening hours, killing one person and injuring 12 others. The town's only church was completely destroyed, several homes received moderate to severe damage, and every building in the small community received a form of damage. As the storms moved into Missouri later that night and into the early morning hours of February 29, numerous strong tornadoes touched down. An EF2 devastated a mobile home park and killed one person near Buffalo, while an EF3 caused another fatality and destroyed homes near Asherville. By 3:00 am CST on February 29, Branson, Missouri was reporting injuries and severe damage to the town from an EF2 tornado, with homes destroyed and several hotels, businesses, and theaters sustaining severe damage. Three other deaths occurred in southern Missouri. As the storms moved into Illinois in the pre-dawn hours, they merged into an intense squall line with embedded semi-discrete supercell thunderstorms. A violent EF4 tornado touched down and ripped through the city of Harrisburg, destroying entire neighborhoods, flattening businesses, and killing 8 people before causing additional destruction in the neighboring town of Ridgway. After sunrise, additional supercells developed and produced numerous tornadoes across Kentucky and Tennessee. Two tornadoes, rated EF1 and EF2, caused significant damage in Greenville, Kentucky. The town of Hodgenville, Kentucky also sustained heavy damage from two separate EF2 tornadoes. An EF1 tornado caused a fatality near Smithville, Tennessee, and an EF2 destroyed homes and killed two more people near Tennessee before the outbreak came to an end. A total of 42 tornadoes were confirmed, and 15 people were killed. There were 225 tornadoes reported in the U.S. in March, of which 150 were confirmed. EF3 damage in downtown West Liberty, Kentucky. Damage from an EF4 tornado in Henryville, Indiana. From March 2 to March 3, a devastating and deadly outbreak of strong to violent tornadoes impacted the Southern United States and Ohio Valley. A moderate risk of severe weather was issued for March 2 a day in advance for a large area from near Tuscaloosa, Alabama to Dayton, Ohio as an intense storm system tracked across the region in a very highly-sheared and unstable environment. On the morning of March 2, it was upgraded and a high risk of severe weather was issued for Middle Tennessee and central Kentucky, later extended into central and southern Indiana and southern Ohio, including a 30% hatched risk area for tornadoes. The Storm Prediction Center mentioned the potential for multiple long-tracked, violent tornadoes. Multiple PDS tornado watches were issued shortly thereafter. For only the second time in history (the first being April 27, 2011 for the 2011 Super Outbreak), Dr. Greg Forbes, severe weather expert for The Weather Channel, issued a TOR:CON (short for "tornado condition index", a scale to rate the risk of tornadic activity over a given region based on atmospheric conditions) rating of 10 out of 10; this time for the Louisville, Kentucky region and along the Ohio River of Indiana and Kentucky. Tornadoes began early; shortly after 9:00 am CST, an intense EF3 tornado north of Huntsville, Alabama resulted in severe damage to houses and also caused damage at a school. A long-lived EF4 formed just north of the Ohio River that afternoon, resulting in extreme damage to numerous communities in southern Indiana, including Marysville and Henryville. Another EF4 wedge tornado killed four people and obliterated homes near Crittenden, Kentucky, while a large EF3 killed three people and destroyed most of Moscow, Ohio. At around 6:00 pm EST, an EF3 tornado impacted downtown West Liberty, Kentucky, resulting in major damage and 10 deaths. A high-end EF3 tornado also caused major damage to many homes in businesses in Salyersville, Kentucky, killing two people along its path. Another high-end EF3 tornado touched down at 8:03 PM. This storm tracked into Haralson County, Georgia and Paulding County, Georgia, where it caused major damage in the Dallas area before dissipating. There was a final tornado-related death toll of 41 people—22 in Kentucky, 14 in Indiana, 4 in Ohio and 1 in Alabama. A total of 70 tornadoes were confirmed as a result of this outbreak. As a weak disturbance moved across the Ohio Valley, energy associated with the system, combined with abnormally warm temperatures, led to the formation of severe thunderstorms from Michigan to the Gulf States, where the Storm Prediction Center had already issued a Slight risk. As the day progressed, isolated thunderstorms began to form and quickly strengthened into tornado-producing cells across the state of Michigan, with Tornado Warnings being issued for Lenawee, Washtenaw, Lapeer, and Monroe Counties. After surveying the area, the National Weather Service confirmed three tornado touchdowns on March 15 across Michigan. The first was an EF0, causing minor tree, structure, and power line damage. The second was rated an EF2, uprooting many trees and shifting a house off of its foundation 3 miles (4.8 km) south of Columbiaville, Michigan, 5 miles (8.0 km) northwest of Lapeer, Michigan. The final was rated an EF3 on the Enhanced Fujita Scale, with winds between 135 to 140 miles per hour (217–225 km/h). This tornado impacted the city of Dexter, where severe structural damage was recorded and multiple homes were destroyed. EF2 damage to a house near LaCoste, Texas. A slow-moving cutoff low produced numerous tornadoes over a seven day period, several of which were strong. On March 18, two EF3 tornadoes and two EF2 tornadoes destroyed homes and caused severe damage near North Platte, Nebraska. On March 19, several more strong EF2 tornadoes touched down in Southwest Texas, and several weak tornadoes impacted the San Antonio, Texas area. Other tornadoes, a few of which were strong, touched down in Louisiana and Mississippi from March 20 and March 22.. One person was slightly injured as a result of an EF2 tornado that struck the town of Gueydan, Louisiana. On March 23, several additional tornadoes were reported across Illinois, Indiana, Ohio, and Kentucky, including a high-end EF1 that caused heavy damage in the Louisville, Kentucky suburbs. One person was killed and two others were injured when a high-end EF2 tornado obliterated a tied-down mobile home near Opdyke, Illinois. On March 24, a weak EF0 touched down in Florida as the system moved eastward and came to an end. At 5 am, an F2 tornado struck the suburb of Vincent in Townsville, Queensland. The tornado ripped roofs off of homes and businesses and was accompanied by heavy rain. Vehicles were flipped, and trees and power poles were snapped. Damage was said to be "worse than Yasi". There were 233 tornadoes reported in the United States in April, of which 205 were confirmed. EF2 damage to homes in Lancaster, Texas. During the afternoon and late evening of April 3, multiple tornadic supercell thunderstorms developed and moved through the Dallas–Fort Worth metroplex, producing multiple destructive tornadoes, injuring many people, and grounding flights at Dallas/Fort Worth International Airport. In Lancaster, just south of Dallas, the Schneider National facility was impacted by a high-end EF2 tornado live on TV, and a news helicopter broadcast live video of large semi-trailers being lofted into the air at that location. The city of Arlington was also hit by a damaging EF2 tornado and declared a state of disaster shortly afterward. The strongest tornado of the outbreak was an EF3 that completely destroyed homes in Forney. A high-end EF2 wedge tornado also caused major damage near Royse City, Texas as well. In addition, numerous weak tornadoes were also observed. Despite the severe damage and injuries, no fatalities occurred. A total of 22 tornadoes were confirmed as a result of this outbreak. A destructive F2 tornado struck a construction site in Elazığ Province, Turkey, killing six people and injuring seven others. All of the fatalities took place at a housing complex within the construction site in Maden. A storage container, a tractor, and multiple trucks were tossed. Several homes were reportedly damaged or destroyed along the 11 km (6.8 mi) path of the tornado, and significant damage was also observed in Dutpinar and Kaşlıca. A large and violent EF4 tornado near Marquette, KS. An impressive low pressure area and associated trough began tracking into the Great Plains on April 13, and a slight risk of severe weather was issued. The outlook mentioned the possibility of tornadoes, including the risk for isolated strong tornadoes. No strong tornadoes occurred, though an EF1 tornado caused considerable damage in Norman, Oklahoma. For only the second time in history (previously for April 7, 2006), a day two high risk  of severe weather was issued by the Storm Prediction Center. In the discussion, the SPC stated that a major tornado outbreak was likely across central Kansas and north-central Oklahoma during the afternoon and overnight hours of April 14, with long-tracked violent tornadoes likely. It was later expanded to include a second high risk area across much of Nebraska, where a rare 45% tornado probability was given during the late morning update on April 13. During the morning hours on the 14th, the high risk area was expanded again to combine the two separate areas into a single large one. Later in the day, the 45% tornado probability was shifted from Nebraska south to Kansas and northern Oklahoma. A large outbreak of tornadoes impacted the Great Plains states on April 14, and several PDS Tornado Warnings were issued during the outbreak. Initially, most of the tornadoes were small or remained over open country, though more significant tornado activity began to develop throughout the day. A high-end EF2 tornado struck Creston, Iowa, flipping vehicles and causing major structural damage to homes and other buildings in town. Another EF2 wedge tornado struck Thurman, Iowa, damaging 75% of the town. In Nebraska, a strong EF2 tornado destroyed outbuildings and badly damaged a home near Cook, while a large and violent EF4 tornado leveled a home and debarked trees near Marquette, Kansas. Later that evening, a cyclic supercell thunderstorm developed in northern Oklahoma before moving into southern Kansas, producing multiple tornadoes along the way. This included a large EF3 wedge tornadoes that destroyed homes near Conway Springs. As this supercell moved into Wichita around 10:15 pm CDT (0315 UTC), another large EF3 wedge tornado touched down and caused major damage in the southeastern part of the city. Staff at the Wichita National Weather Service Weather Forecast Office at Wichita Mid-Continent Airport were forced to hand over responsibility for their County Warning Area to the National Weather Service offices in Topeka and take shelter at about 10:00 pm CDT (0300 UTC), returning to duty half an hour later. Another supercell thunderstorm also produced two EF3 wedge tornadoes that passed near Fellsburg and Hudson, causing significant damage. Around 10:00 p.m. CDT (0300 UTC), a broken squall line began to form across the eastern portions of the Texas and Oklahoma panhandles; a thunderstorm developed ahead of the northern line segment in northwestern Wheeler County, Texas at approximately 10:30 p.m. CDT (0330 UTC), and began developing supercell characteristics as it tracked northeastward into the Oklahoma counties of Ellis and Roger Mills. A tornado warning was issued for Ellis, Harper and Woodward counties at 12:00 am CDT (0500 UTC) on April 15 after weather spotters reported a tornado spawned by this supercell located 7 miles (11 km) southeast of Gage in Ellis County. This high-end EF3 tornado later struck Woodward, Oklahoma at 12:20 am CDT (0520 UTC), killing six people. Multiple homes and businesses were destroyed in Woodward, and all fatalities occurred as a result of destroyed mobile homes. Additional weak tornadoes occurred on April 15 and 16 before the outbreak came to an end. A total of 113 tornadoes were confirmed as a result of this outbreak. There were 139 tornadoes reported in the U.S. in May, of which 121 were confirmed. On May 6, a powerful and destructive F3 tornado tracked through the town of Tsukuba, Ibaraki roughly 40 mi (64 km) away from Tokyo, Japan, killing one person and injuring forty-five others. Many homes were damaged or destroyed by the tornado, including a few that were leveled or swept clean from their foundations. One house was rolled onto its roof and collapsed, pulling its entire concrete slab foundation out of the ground in the process. Homes that remained intact sustained loss of roofs and exterior walls, and were shredded by flying debris. Metal warehouse buildings sustained severe damage as the tornado impacted industrial areas of town, and a large 5-story apartment building sustained major damage to its exterior and interior. Trees were snapped and debarked, power poles were downed, and many vehicles were tossed, piled atop each other, and destroyed. Large amounts of sheet metal roofing was scattered throughout the damage path, much of which was wrapped around power lines. Masonry fences were toppled over, and a gas station canopy was destroyed as well. The tornado destroyed at least 50 houses and left roughly twenty thousand people without electricity. The Tsukuba tornado was clearly visible on radar while it was on the ground, with a hook echo and mesocyclone evident. A second tornado, rated F1, struck Moka, Tochigi and injured one person as well. On the evening of May 25, a small outbreak of tornadoes impacted southern Kansas, including a few strong tornadoes. A large EF2 was documented by numerous storm chasers as it passed near the town of La Crosse, causing significant damage to farmsteads, outbuildings, and trees. This tornado spawned two satellite tornadoes as well, including an EF1 that struck La Crosse directly, resulting in minor to moderate damage in town. The second satellite tornado was an EF2 that caused extensive tree damage. Just south of Russell, an EF2 tornado struck a subdivision and damaged several manufactured homes, completely destroying one of them. Another EF2 tornado caused significant damage to vegetation and power lines near Bison. A total of 13 tornadoes were confirmed. There were 116 tornadoes reported in the U.S. in June, of which 112 were confirmed. An isolated EF2 tornado touched down in Diehlstadt, Missouri late on June 4. It was only on the ground very briefly, but hit a mobile home while down, killing three occupants. It was the first killer US tornado since the April 14 outbreak. The tornado was embedded in a larger microburst. A brief landspout tornado also touched down in Arkansas and was rated an EF0. Another brief EF0 tornado touched down in Texas. A damaging high-end F1 tornado tore through the northern suburbs of Dianella and Morley in Perth, Western Australia at about midday. Multiple homes sustained considerable roof damage, trees were downed, and a video store was badly damaged. Winds associated with the tornado were estimated at around 180 km/h. An F2 tornado touched down in the town of Montfort. Several houses were badly damaged, but there were no casualties reported. The tornado only reached F2 strength for a short time; it was F0 or F1 during most of its lifetime. A tornado (likely an F2) hit the east part of the city of Venice (Veneto, North-East Italy), notably the isles of Saint Helen, Saint Erasmus and Lido, and the nearby town of Treporti; no casualties reported. Several tornadoes were spawned from the outer bands of Tropical Storm Debby in the Florida peninsula. On the afternoon of June 23, at least one tornado touched down in Naples, Florida with significant damage reported. Further tornadoes touched down starting in the morning of June 24 and continuing through the day across several regions of Florida. One person was killed in Lake Placid from an EF2 tornado there that damaged numerous houses. At least 18 tornadoes were confirmed over the two-day period in Florida. The 10 tornadoes (all EF0) in South Florida was the region's largest tornado outbreak in over 50 years. There were 24 tornadoes reported in the U.S. in July, however 35 were confirmed. Lumber damage from an F3 tornado that struck Poland on July 14. Three tornadoes impacted the Pomerania region of Poland on July 14, two of which were strong and caused significant damage. The first was a large F3 stovepipe tornado that struck Barlewiczki, causing heavy structural damage to homes, barns, and businesses, downing many trees and power poles, and injuring several people before dissipating. A total of 22 buildings were damaged or destroyed by the Barlewiczki tornado, which was caught on video and photographed by numerous local residents. A second F3 tornado impacted the Wycinki area, completely flattening a massive swath of trees in the Bory Tucholskie National Park and damaging or destroying multiple homes. A 60 year-old man was killed in the complete destruction of his summer home near Wycinki, and multiple other people injured along the path. This included a family of three that sustained injuries after a large tree crushed their home. The final tornado was an F1 that caused roof damage in Bagienica. There were 52 tornadoes reported in the U.S. in August, of which 40 were confirmed. Two short-lived tornadoes touched down in the suburbs of Adelaide, South Australia. The tornadoes brought extensive damage to homes, trees and powerlines. On August 27, a rain band from Hurricane Isaac produced a brief EF0 tornado near Vero Beach, Florida that damaged about 100 structures. Two days later, on August 29, several weak tornadoes touched down across Alabama, Florida, and Mississippi in association with the landfall of Isaac. This continued through September 1 as Isaac's remnants moved northward into the Midwest. Alabama, Mississippi, Arkansas, Missouri, Illinois, Indiana, Delaware, and New Jersey all recorded several, mostly weak, tornadoes until the remnants of Isaac moved away from the United States. There were 45 tornadoes reported in the U.S. in September, of which 39 were confirmed. Just after midnight on the morning of September 8, a weak EF0 tornado touched down near Newtonsville, Ohio and caused minor roof damage to a few homes. The same day, late in the 10:00 AM (EDT) hour, a waterspout formed just off the coast of Queens and moved onshore near Breezy Point. Once onshore, the storm caused structural damage and downed power lines. Damage continued into the Canarsie, Brooklyn area before the tornado dissipated. This section of the tornado received a rating of EF0. it then moved back over water and then back on shore as a stronger tornado in the Canarsie section of Brooklyn and was given a high-end EF1 rating. There were 41 tornadoes reported in the U.S. in October, of which 36 were confirmed. During the evening hours of October 17, a fast-moving and powerful low-pressure system brought severe weather, including significant tornadoes, to portions of Mississippi and Arkansas. Seven EF1 and two EF2 tornadoes—including one that injured four people—were confirmed by the National Weather Service office in Jackson, Mississippi, along with a minimal EF3 with maximum sustained winds of 140 mph. This tornado injured one person and is one of only two EF3's to ever be recorded in the state of Mississippi during October. Two other tornadoes, rated EF0 and EF1, were confirmed by the National Weather Service in Little Rock, Arkansas. As the system moved eastward on October 19, two addintional tornadoes, EF0 and EF1, touched down in Pennsylvania and Maryland. Several structures were damaged and 15 people were injured in the Pennsylvania tornado. There were 9 tornadoes reported in the U.S. in November, of which at least 7 were confirmed. On this day an unstable air mass, coming from the Southwest (Atlantic), associated with a depression, with expression in the high levels of the troposphere and the core centered to the West of Lisbon, brought some unsettled weather to Portugal, in particular to the region of Algarve which was hit by most of the storm cells that were moving inland. Embedded in this instability, Mesoscale Convective Systems developed with associated tornado activity being registered. One major tornado which caused significant damage to people's houses and cars among other structures was registered to have passed through Carvoeiro, Lagoa and Silves. A tornado struck a steel plant in southern Italy on Wednesday just days after its owners announced their intention to close what is Europe's largest steel facility. One person was reported missing and some two dozen were injured when the tornado struck, the ANSA news agency said, adding that the Ilva plant sustained significant damage. Over a two-day period, six tornadoes touched down across Italy and Greece, the strongest of which was an F3 on November 28 near Taranto which killed one person and injured forty. There were 93 tornadoes reported in the U.S. in December, of which at least 53 were confirmed. An estimated EF2 tornado killed three people and injured seven, with damage to as many as 150 homes in the rural suburb of Hobsonville, Auckland, New Zealand. The residential centre of the tornado's destruction was Wallingford Way, in Hobsonville. A cold front produced severe thunderstorms across the Southern United States which spawned at least seven weak tornadoes. A relatively long-track EF1 tornado traveled across two counties in southern Mississippi, destroying a barn, a gazebo, and a metal building. Another EF1 tornado struck the Birmingham, Alabama area, tearing part of the roof from a warehouse, and completely removing the roof of one home. A high-end EF1 tornado struck a mobile home park near Edgewater, Florida, damaging over 60 homes and injuring two people. A moderate risk of severe weather was issued for much of the Gulf Coast region as an intensifying area of low pressure tracked across the region starting on December 25. It was extended to December 26 as well over parts of the Carolinas. Several tornadoes were reported on December 25, especially across Louisiana and Mississippi. At 5:00 pm CST (2300 UTC), a tornado emergency was issued for Downtown Mobile, Alabama as a large tornado was approaching the downtown area. The tornado was later rated an EF2 on the Enhanced Fujita scale. 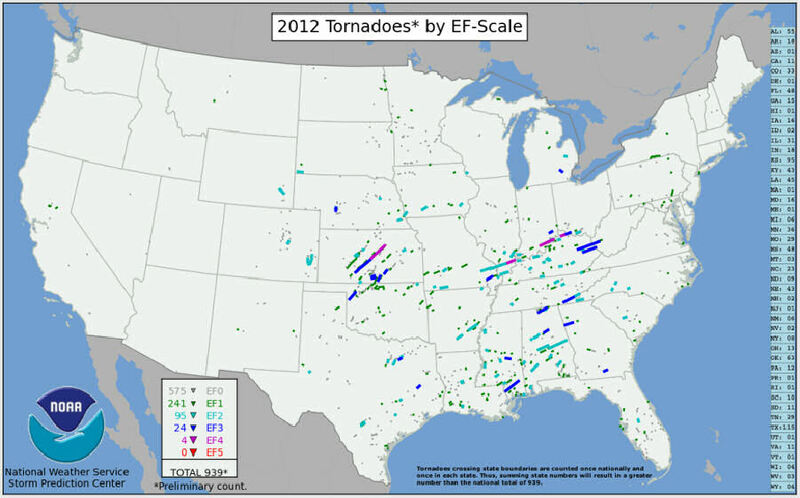 ^ "2012 Tornadoes by EF-Scale". Storm Prediction Center. National Oceanic and Atmospheric Administration. Retrieved May 10, 2015. ^ "United States Tornadoes of 2012" (PDF). Storm Prediction Center. Retrieved 13 January 2013. ^ "Annual U.S. Killer Tornado Statistics". Storm Prediction Center. National Oceanic and Atmospheric Administration. Retrieved January 18, 2016. ^ Thompson and Cohen (January 9, 2012). "Jan 9, 2012 1630 UTC Day 1 Convective Outlook". Storm Prediction Center. National Oceanic and Atmospheric Administration. Retrieved January 28, 2012. ^ Broyles (January 9, 2012). "Mesoscale Discussion 10". Storm Prediction Center. National Oceanic and Atmospheric Administration. Retrieved January 28, 2012. ^ "January 9, 2012 Severe Weather". National Weather Service Office in Galveston, Texas. National Oceanic and Atmospheric Administration. January 17, 2012. Retrieved January 28, 2012. ^ Jewell and Leitman (January 10, 2012). "Jan 10, 2012 0600 UTC Day 1 Convective Outlook". Storm Prediction Center. National Oceanic and Atmospheric Administration. Retrieved January 28, 2012. ^ "January 10, 2012 Storm Reports (1200 - 1159 UTC)". Storm Prediction Center. National Oceanic and Atmospheric Administration. January 20, 2012. Retrieved January 28, 2012. ^ Thompson and Cohen (January 11, 2012). "Jan 11, 2012 1630 UTC Day 1 Convective Outlook". Storm Prediction Center. National Oceanic and Atmospheric Administration. Retrieved January 28, 2012. ^ "National Weather Service Text Product Display". Forecast.weather.gov. Retrieved 2012-12-07. ^ Colleen Jeremy (January 27, 2012). "Alabama falls victim to yet another outbreak of tornadoes this week – estimated cost of disaster at $30 million". Live Insurance News. Retrieved January 28, 2012. ^ "Thunderstorms pound Texas; tornado hits Austin". Reuters. Yahoo! News. Retrieved 25 January 2012. ^ "Storm produces tornado in Northeast Austin, damage from flooding across region". Statesman. January 27, 2012. Archived from the original on January 28, 2012. Retrieved January 28, 2012. ^ "Tornado hits Indonesia, kills five". Xinhua News. New Straits Times. February 25, 2012. Retrieved February 28, 2012. ^ "Harveyville Tornado Claims 1 Life". Archived from the original on 2013-01-27. Retrieved 2012-05-01. ^ "Six now reported dead in southern Illinois tornado". Southern Illinois News. Southernillinois.14wfie.com. 2012-02-29. Archived from the original on 2012-07-30. Retrieved 2012-12-07. ^ "13 killed as tornadoes rake Midwest states". NBC News. February 29, 2012. Archived from the original on February 29, 2012. Retrieved February 29, 2012. ^ "Storm Prediction Center Mar 1, 2012 1730 UTC Day 2 Convective Outlook". Spc.noaa.gov. 2012-03-01. Retrieved 2012-12-07. ^ Tornado wrecks Indiana town as Midwest is slammed with severe storms, Fox News, 2012-03-02. ^ "Tornado-ravaged areas hit by snowstorm". Reuters. 2012-03-05. Retrieved 2012-03-05. ^ Cindy Heflin (2012-03-16). "Weather service map pinpoints Southeast Michigan tornado, hail, funnel cloud sightings". Annarbor.com. Retrieved 2012-12-07. ^ "Columbiaville, Michigan Close to an EF-2 Tornado". OKCStormWatcher's Weather Blog. Okcstormwatcher.wordpress.com. 2012-03-16. Retrieved 2012-12-07. ^ Behind story from newspaper reporting on: USATODAY Page, About this day of Tornado in the local. ^ Weather team Reporting on The Weather Channel Archived 2012-03-17 at the Wayback Machine Website from Tornado in March 15. More Exclusive Details for Reading & Social Online! ^ Weather Page Reportings from Accuweather News, On this page you can find Exclusive Videos before and after the tornado & few pictures and Details too! ^ "Devastation in SE Michigan after a tornado moves through". Clickondetroit.com. Archived from the original on 2012-07-24. Retrieved 2012-12-07. ^ "VIDEO: Devastating damage from tornado near Dexter". Wxyz.com. Archived from the original on 2012-07-15. Retrieved 2012-12-07. ^ "At least one Texas tornado damages homes, storms cause flooding". Reuters. 2012-03-20. ^ "Picking up the pieces after Townsville's tornado terror". Brisbane Times. June 9, 2012. ^ Sampson, Matt (2012-04-03). "Tornado Emergencies in Texas". weather.com. Retrieved 2012-12-07. ^ "Tornadoes tear through Dallas-Fort Worth area". CNN. 2012-04-04. Retrieved 2012-04-03. ^ "European Severe Weather Database". European Severe Storm Laboratory. 2012. Retrieved April 10, 2012. ^ "Tornado kills six in central Turkey". Today's Zaman. April 9, 2012. Retrieved April 10, 2012. ^ "Storm hits Iowa hospital; tornado warning issued for Wichita". CNN. April 15, 2012. ^ Kevin Darmofal, NWS Wichita Lead Meteorologist (April 20, 2012). "Why NWS Wichita Took Shelter and Requested Service Back-up the Evening of April 14, 2012". National Weather Service. Retrieved April 21, 2012. ^ "Most Popular E-mail Newsletter". USA Today. April 15, 2012. ^ "Quick Report on Damage to Buildings by the Tornado on May 6, 2012 in Tsukuba City, Ibaraki Prefecture, JAPAN" (PDF). May 8, 2012: 17. Retrieved September 19, 2018. ^ "Japan Tornado: Twister Near Tokyo Kills 1, Injures Dozens". Huffingtonpost.com. 2012-05-06. Retrieved 2012-12-07. ^ "One killed, scores injured as tornado rips through Japan (PHOTOS, VIDEO)". Rt.com. Retrieved 2012-12-07. ^ "Regarding the tornadoes that formed on May 6, Heisei 24 (2012) (Report)" (PDF) (in Japanese). Japan Meteorological Agency. 2012-06-08. Retrieved Mar 27, 2014. ^ "May 19th 2012 Tornadoes". Crh.noaa.gov. 2012-05-19. Retrieved 2012-12-07. ^ Gold, Liz (2012-05-20). "Tornado tears off motel roof in St. Petersburg". Abcactionnews.com. Archived from the original on 2012-07-24. Retrieved 2012-12-07. ^ "May 25, 2012 Rush County Tornado". Crh.noaa.gov. 2012-05-25. Retrieved 2012-12-07. ^ "Damage Survey Results for Diehlstadt, MO event June 4, 2012". NWS Paducah. June 5, 2012. ^ "Tornado winds were up to 180 km/h - and brace for more wild weather". Perth Now. June 9, 2012. ^ "Perth tornado terror". News WA. June 9, 2012. ^ "Tornado walst over Montfort". RTL Nieuws. June 7, 2012. ^ "Montfort tornado video footage, tornado reaches maximum strength at 2:38". Youtube.com. 2012-06-07. Retrieved 2012-12-07. ^ "Tornado at Lido and Sant'Elena". Gazzettino.it. Retrieved 2012-12-07. ^ "Tornado in Venice". Nuovavenezia.gelocal.it. 2012-06-12. Retrieved 2012-12-07. ^ "Tornado in Venice (video footage)". Youtube.com. 2012-06-12. Retrieved 2012-12-07. ^ "Tornado in Venice and on the Venetian Coast: report" (PDF). 2012-06-12. Retrieved 2012-12-07. ^ "Storm Prediction Center 20120623's Storm Reports". Spc.noaa.gov. 2012-06-23. Retrieved 2012-12-07. ^ "Storm Prediction Center 20120624's Storm Reports". Spc.noaa.gov. 2012-06-24. Retrieved 2012-12-07. ^ "Tornado Outbreak June 23-24" (PDF). srh.noaa.gov. ^ "Poland shocked by tornadoes, one dead". Trust.org. July 15, 2012. Archived from the original on March 13, 2013. ^ Hyde, Ben (2012-08-26). "Wind gust rips through Windsor Gardens street leaving a trail of damage". adelaidenow. Retrieved 2012-12-07. ^ "Iowa Environmental Mesonet". Mesonet.agron.iastate.edu. 2012-08-29. Retrieved 2012-12-07. ^ "Storm Prediction Center 20120829's Storm Reports". Storm Prediction Center. National Oceanic and Atmospheric Administration. 2012-08-29. Retrieved 2012-12-07. ^ "Preliminary Tornado Survey for 9/1 Storms". National Weather Service in Memphis, Tennessee. National Oceanic and Atmospheric Administration. Retrieved 2012-12-07. ^ "National Weather Service, Lincoln IL - Summary of Hurricane Isaac Remnants on Central and Southeast Illinois". National Weather Service in Central Illinois. National Oceanic and Atmospheric Administration. Retrieved 2012-12-07. ^ "September 7-8, 2012 Severe Weather and one Tornado". National Weather Service Wilmington, Ohio. 2012-09-09. Retrieved 2012-12-20. ^ "2 tornadoes touch down in NYC neighborhoods". Usnews.nbcnews.com. 2012-10-24. Retrieved 2012-12-07. ^ "Tornado confirmed near Breezy Point in Queens County NY". NWS New York City. Retrieved 9 September 2012. ^ "Tornado confirmed near Canarsie in Kings County NY". NWS Upton, NY. Retrieved 9 September 2012. ^ "Tornado hits Drummondville, thousands lose power in Saturday's storm". Ottawacitizen.com. 2012-09-09. Retrieved 2012-12-07. ^ "Ontario's 8th tornado of 2012 confirmed". The Weather Network. 2012-01-02. Retrieved 2012-12-07. ^ "October 17-18 Severe Weather Event". NWS Jackson, MS. Retrieved 19 October 2012. ^ "Severe Storms on October 17, 2012". NWS Little Rock. Retrieved 19 October 2012. ^ "EF-0 Tornado confirmed near Jarrettsville, Maryland". NWS Sterling, VA. Retrieved 23 October 2012. ^ "Lancaster County – Drumore to Paradise tornado October 19, 2012" (PDF). NWS State College, PA. Retrieved 23 October 2012. ^ "Freak tornado hits disputed Italy steel plant". London: The Independent. November 29, 2012. Retrieved 2012-11-29. ^ "Selected data from the database". ESWD European Severe Weather Database. Retrieved 31 December 2012. ^ "Hobsonville Tornado - a 200km/h wall of wind". weatherwatch.co.nz. Retrieved 2012-12-07. ^ "Auckland tornado kills 3, hits 150 homes". Stuff.co.nz. 2012-12-07. Retrieved 2012-12-07. ^ "SPC Storm Reports for 12/09/12". Storm Prediction Center. Retrieved 11 December 2012. ^ "SPC Storm Reports for 12/10/12". Storm Prediction Center. Retrieved 11 December 2012. ^ "Severe Weather Event December 10, 2012". National Weather Service New Orleans/Baton Rouge. Retrieved 12 December 2012. ^ "Walthall County Tornado - December 10, 2012". NWS New Orleans/Baton Rouge. Retrieved 11 December 2012. ^ "Marion County Tornado". National Weather Service Jackson, Mississippi. Retrieved 11 December 2012. ^ "Tornado Damage on December 10th, 2012 Birmingham (Jefferson) EF-1 Tornado". National Weather Service Birmingham, Alabama. Retrieved 11 December 2012. ^ "Edgewater Tornado". National Weather Service Melbourne, Florida. Retrieved 12 December 2012. ^ "December 25, 2012 0600 UTC Day 1 Convective Outlook". Storm Prediction Center. Retrieved 25 December 2012. ^ "December 25, 2012 1730 UTC Day 2 Convective Outlook". Storm Prediction Center. Retrieved 25 December 2012. ^ "SPC Storm Reports for 12/15/12". Storm Prediction Center. Retrieved 25 December 2012. ^ "KMOB 2012 Tornado Warning #122". 2012-12-25. Retrieved 2012-12-25. ^ "Public Information Statement". National Weather Service Mobile, Alabama. Retrieved 27 December 2012. This page was last edited on 7 April 2019, at 04:09 (UTC).